When you use too many nail polishes or too frequently change them, it is crucial to invest in some quality nail care products. While adding a few to my stash I got this Sally Hansen Strength Treatment 18K Gold Hardener polish. To be true, the gold in nail polish and having it on my nails attracted my attention towards it and it looks so attractive. I got it along with Sally Hansen Miracle Nail Thickener. Let's have a look if this base coat worked for my nails or not! 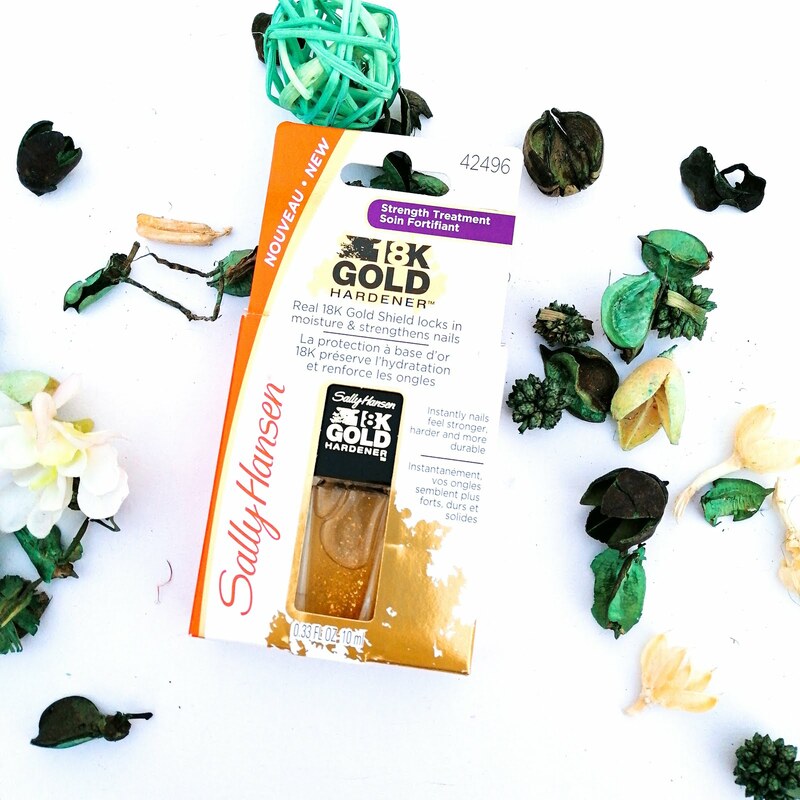 Lock in moisture and strengthen nails with Sally Hansen Real 18K Gold. 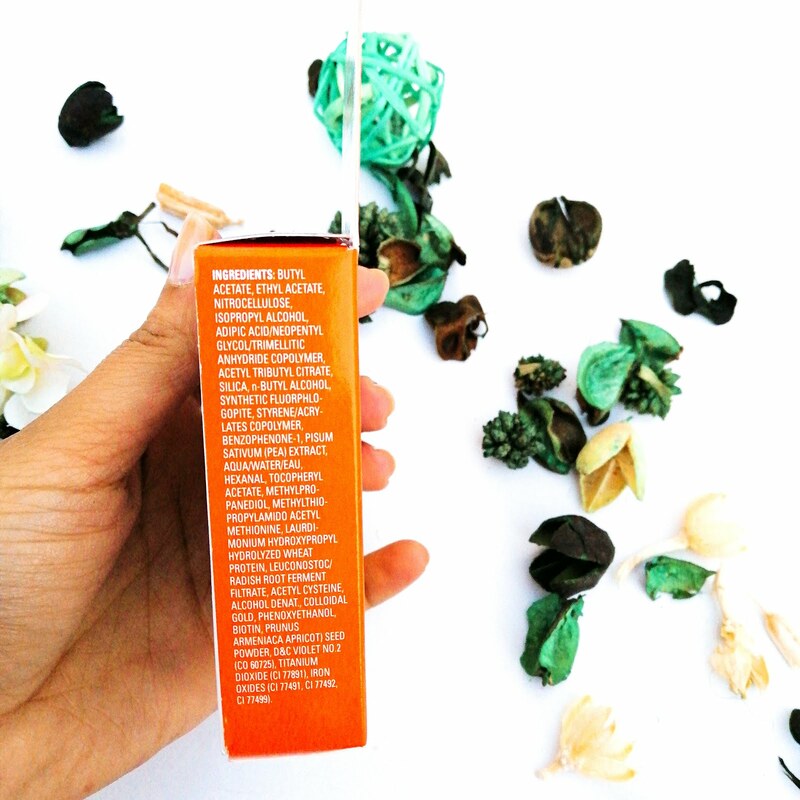 It instantly hardens & fortifies nails to prevent breaking, chipping and splitting. 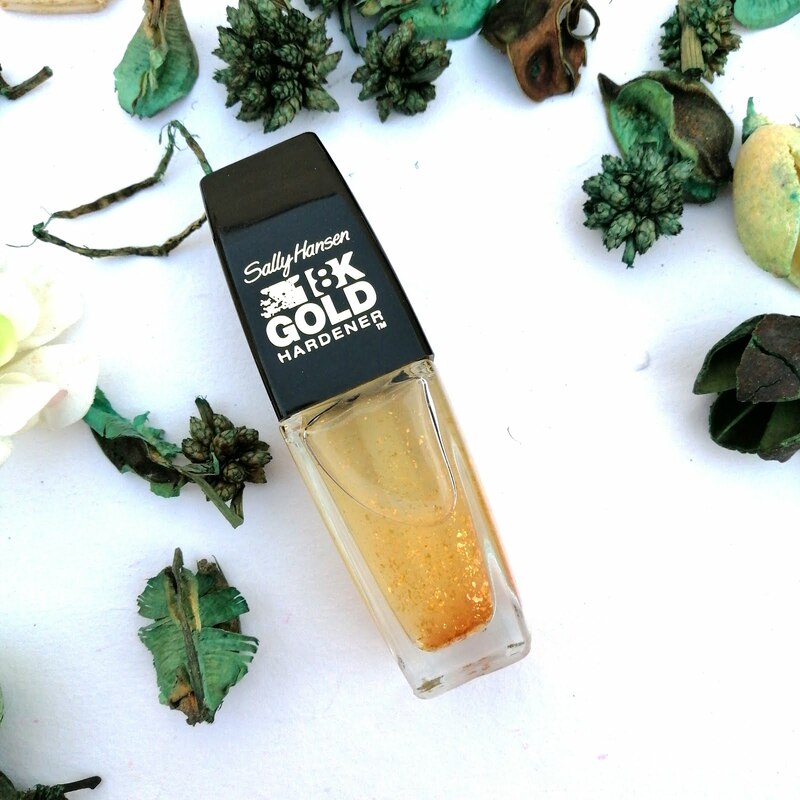 Gold shield forms a protective barrier to lock in moisture, nails grow longer & stronger. The breakthrough complex envelopes the gold, creating shatter-proof shield that protects nails so they grow stronger and longer. Rs. 460 for 10ml. I got it on discount at Rs. 230 so you can also try to get that on several online beauty stores. Butyl Acetate, Ethyl Acetate, Nitrocellulose, Isopropyl Alcohol, Adipic Acid/Neopentyl Glycol/Trimellitic Anhydride Copolymer, Acetyl Tributyl Citrate, Silica, N-Butyl Alcohol, Synthetic Fluorphlogopite, Styrene/Acrylates Copolymer, Benzophenone-1, Pisum Sativum (Pea) Extract, Aqua/Water/Eau, Hexanal, Tocopheryl Acetate, Methylpropanediol, Methylthiopropylamido Acetyl Methionine, Laurdimonium Hydroxypropyl Hydrolyzed Wheat Protein, Leuconostoc/Radish Root Ferment Filtrate, Acetyl Cysteine, Alcohol Denat., Colloidal Gold, Phenoxyethanol, Biotin, Prunus Armeniaca Apricot) Seed Powder, D&C Violet 2 (CO 60725), Titanium Dioxide (CI 77891), Iron Oxides (CI 77491, CI 77492, CI 77499). 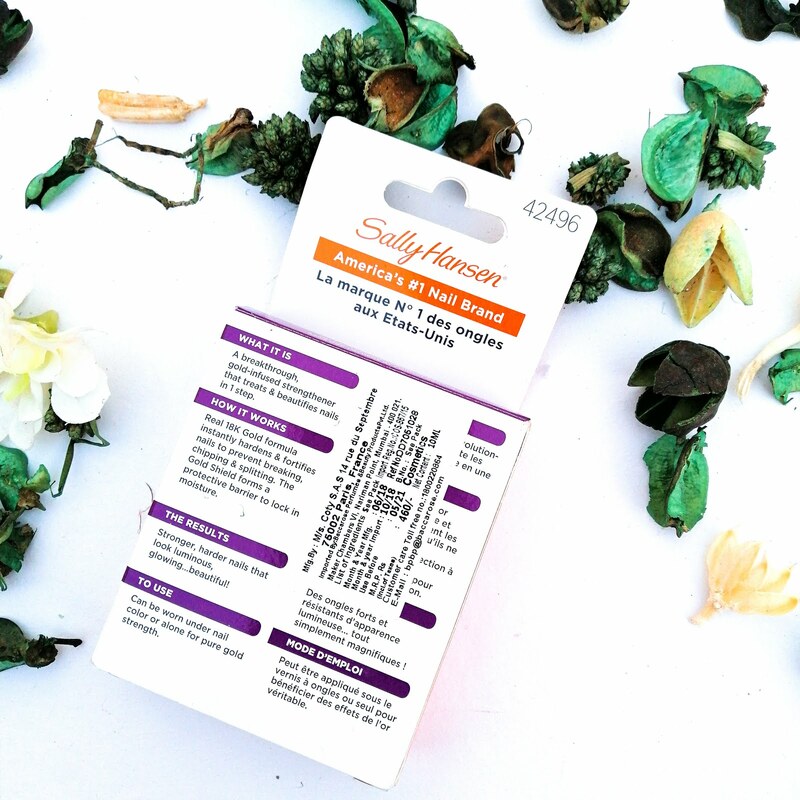 I have been using it as a base for my nails, adding that extra layer of protection. It has lots of glitters but once you apply the gold hardener, they don't pop up or felt as the regular glitter nail polishes do. The polish lasts for about 4 days before chipping occurs and when you take it off with regular nail polish, many of the gold chips remain behind, which is fine if I am reapplying, but if not, treat like glitter polish to remove. Looking at the gold particles, I doubt they are actually 18K or even gold for that matter. It looks a bit yellowish but after applying on nails, it will turn into the plain transparent polish. I use it as a base coat and to add a fine layer of glitter on any nail polish. Adds right glamour touch to them. You can try it too. I didn't see any hardening effect so m not sure, but it works great as a base coat. Keeps nails from getting yellow with nail polish. So, have you tried it? What are your thoughts on this? Share your views with me in the comments below!